Magnescale’s know-how about magnetism has resulted in the development of several magnetic measuring principles, among which Magnescale and Digiruler. These unique measuring principles are applied in both the scales as the probes. Well resistant to dirt, chips, oil, shocks and vibrations in comparison with other measuring principles. Reliable even in the harshest environments. 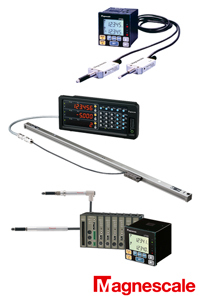 The Magnescale measuring systems have a leading position in the international market for DRO equipment. In comparison with other systems Magnescale always comes out on top. In the end the quality of Magnescale always turns out to be decisive. The Magnescale systems offer optimal reliability and are with an unprecedented lifetime for every company a justified and interesting investment. Therefore we offer a two-year guaranty on the Magnescale measuring systems.